New initiative designed to better tap into peer-to-peer fundraising this Christmas. Text “quick” to 71777 to see a sample Mobile Red Kettle campaign, “Give Christmas Away.” The new platform is available this holiday season in addition to the Online Red Kettle. The Southwest Division is testing a peer-to-peer fundraising campaign this month to raise $10,000 to feed local families through an average $10 gift from 1,000 people. The test is part of a national shift in fundraising that banks on the recommendations of friends or family, and leads donors to give immediate, small amounts. The goal is for every $10 donation to provide 30 meals, Comer said, and with $10,000 The Salvation Army in the Southwest can serve 7,500 families in need. “We’re focusing on food because our pantries have hovered at emergency thresholds for too long, and the purchase of food takes funding away from rental assistance for families,” she said. In her community of Las Vegas—one of three target cities for the campaign including Phoenix and Albuquerque, N.M.—15 percent of the county’s population (roughly 300,000 people) are food insecure, according to Feeding America. The October test will help The Salvation Army prepare for a new Mobile Red Kettle that will be available this holiday season in addition to the Online Red Kettle, which last year raised $2.4 million nationally (up from $2.1 million in 2012). Overall, the 2014 Red Kettle Campaign raised $135.9 million through the support of donors and corporate partners. The added approach is one outcome of ongoing work to strategize marketing tactics with a team of 16 digital specialists across the Western Territory, including Comer, led by Director of Digital Strategy Angela McIntosh. Social fundraising is up 32 percent since 2012, according to the DonorDrive 2015 State of Peer-To-Peer Fundraising Report. Further, two-thirds of mobile donations that come through social media are from smartphones. 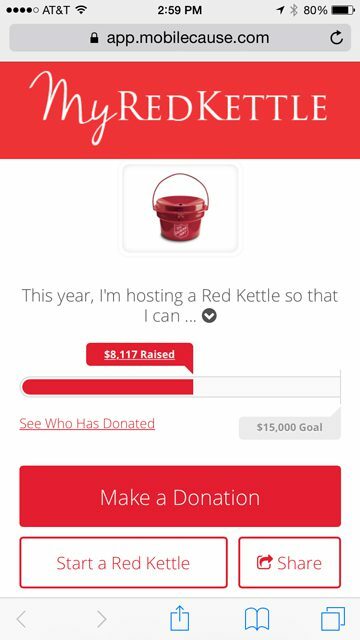 Unlike the Online Red Kettle, the Mobile Red Kettle (powered by MobileCause) uses responsive design, meaning that the pages automatically adjust to the user’s device. For millennials, this means a clean and simple experience, for boomers it means the text gets bigger and easier to read in all the right places. As a bonus, it takes an administrator (divisional staff) 15 minutes to set up, an individual fundraiser three minutes to set up, and a donor just 90 seconds to give. A sample campaign, “Give Christmas Away,” is currently accessible by texting “quick” to 71777, and a demo is viewable on YouTube. But first, the Southwest Division is stocking its shelves.